Cooking is Fun is a beginner’s cookbook with a refreshing new approach. ?The recipes are as easy as pie and will provide balanced meals if prepared with natural, fresh ingredients. In order to teach children from an early age to prepare healthful meals, natural products such as fibre, sunflower oil, whole meal, brown rice and brown sugar instead of refined products should be used. Some recipes are simple enough for five-year-olds and six-year-olds to prepare, and there are lots of other recipes for children of all ages. Mom will most probably borrow the book now and then, and Dad in particular will find it useful for that delicious little suprise he is planning for Mom’s birthday. 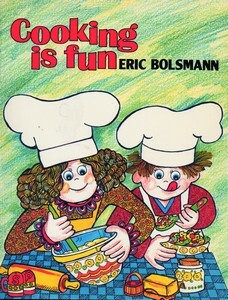 Cooking is Fun was published by HAUM Publishers in Pretoria as a large format 72-page soft-cover edition in 1985.